I've decided that I should be the official mascot for the release of the new "Tiger" operating system. I know you think I am a retarded monkey and I'm obviously kidding... to a point. Needless to say I had a little fun (point number one: don't ever be without set things to do when you are without work) (point #2: don't be without work :) So.. I decided to dye my hair. 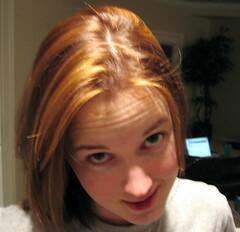 Now after having prior experience with having my hair dyed you'd think I'd be a little more prepared for the outcome. Well I was, kinda. [I know what wonderful English ;)] So I did one of these little 2 step kit thingys, and I'm orange and skunked. Brunettes, and I'll clarify that with dark brunettes, should just flat out beware. I only tried to go to a lighter brown with highlights.. complete crappy experience. I tried to test it on a piece of my hair, but of course that gave me basically no results that I could judge from. So, balls to the wall and sucked it up. (the balls to the wall thing was easy b/c I obviously don't have 'em ) Eh, its not so bad to be a UT fan!! What the hell am I saying..Quick! Where's the blue dye??!! And after a week or so I know it will fade, it just happens to look like someone grabbed some chuncks of my hair and bleached them golden. It's only been a day so I'll give it some more time... ok times up... just kidding.